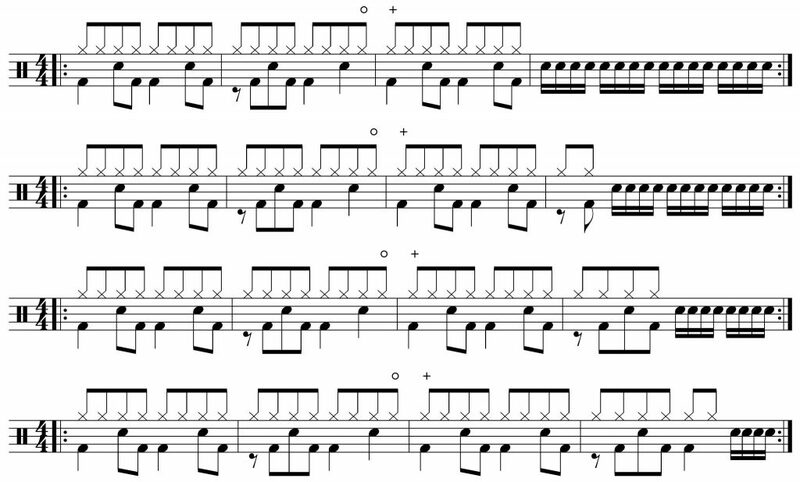 This is a cool 16th note fill incorporating flams and the bass drum. When I’m playing flams in a 16th note fill, I like to play the bass drum just before the flam. This gives me plenty of time to set up my flams so I can make them sound big while keeping the 16th note flow going. Our next step is to add in the Left hand. This will create the flams on beat 1, the “&” of 2 and beat 4 and, fill in 16th notes on the “&” of 1, “e” of 3″ and “ah” of 4. I’ve included the counting on this one to help you out. 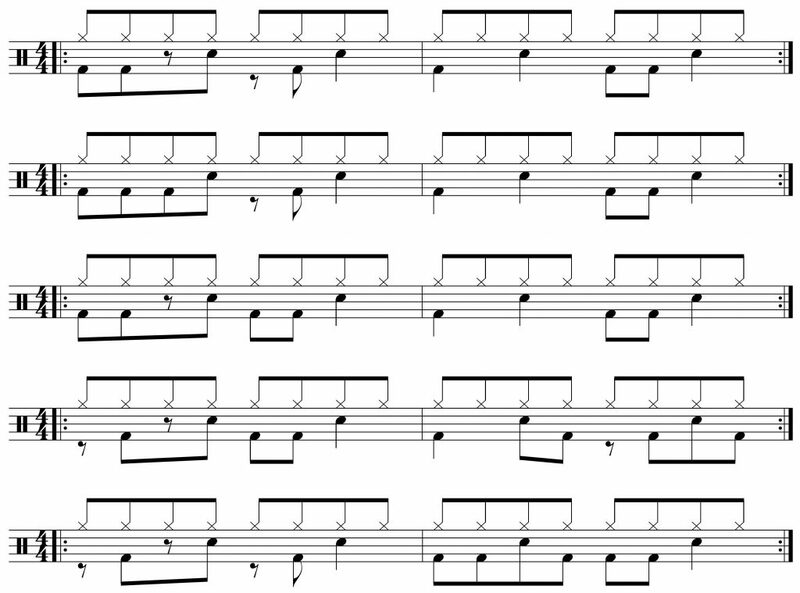 Practice this slowly at first at 40 – 50 bpm. You may want to build it up a note at a time. Start with the first 4 notes and then add the next one, and then the next one and so on. If you can play the first 6 notes you have most of the fill already because the next 6 notes are just the same thing repeated and beat four is just the first four notes played on a different drum. Can you see the 6-6-4 pattern now? Another simple variation is to play on the move the non-flammed notes to different toms – this still gives you the impact of the flam on the snare. I hope you’ve enjoyed fill of the week #6 – play around with it some more and create your own variations. If you’re in Singapore and you’d like a free trial drum lesson then use the contact us page to let us know & we’ll arrange it for you. Groove of the week #6 Check blog for tips on taking it further. Link in profile. #drums #drumlessons #drummersofinstagram #rhythmhousesg #rhgrooveoftheweek. I first remember hearing this kind of funky, syncopated two bar pattern in the chorus of the Billy Joel song Easy Money from the Innocent Man Album. I instantly fell in love with the groove and it became one of my favourite songs to drum to. You’ll also hear this kind of pattern throughout funk music; Cold Sweat by James Brown is another great example of this kind of beat. Similar to Groove of the week #5, this is a two bar pattern and presents the same challenges. You need to be able to perform the two bar pattern consistently and you need to be able to add drum fills to it. Try the groove with a variety of fills – such as the ones suggested in groove of the week #5, any of our fill of the week suggestions or the fills below. The fills for groove of the week 5 all started on the beat, all of these fills start and the “&”. You want to be comfortable starting fills both on and off the beat. Have fun with groove of the week 6! If you’re in Singapore and you’d like a free trial drum lesson, send us a message on the contact us page. This fill has a lot of interplay between the hands and the bass drum, I hope you’ve been working on your co-ordination. Let’s break this fill down into simple steps. If you have worked on Fill Of Week #4, then you’ll notice that the right hand is playing the same pattern as that fill. Now we’re playing the pattern between snare drum and floor tom instead of snare drum and bass drum. Our next step is to add in the bass drum to get the interplay between the right hand and the bass drum correct. 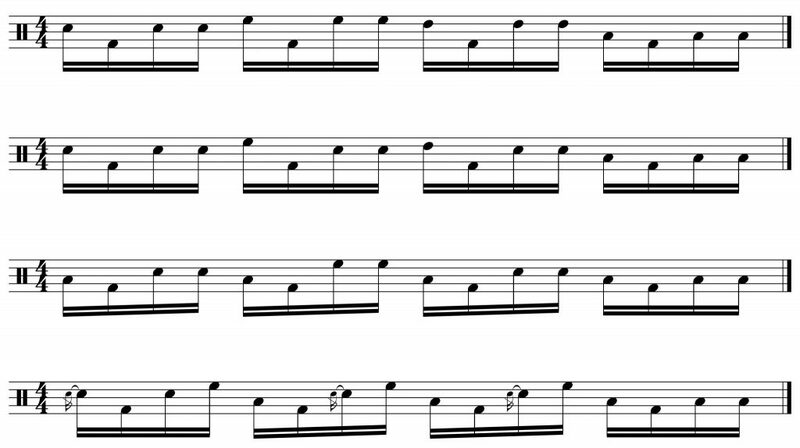 Make sure your snare and bass drum notes are evenly spaced – we don’t want any unintentionally swung notes. Work on it slowly with a metronome. Finally – add the left hand to create the flams on the snare and play the final floor tom note. Flat Flams on snare and crash, Tom Tom notes moved around the kit. Have fun with fill of the week #5! If you’re in Singapore and you’d like a free trial drum lessons, contact us through the contact us page. I’ve always loved this beat. Skipping the bass drum on beat 1 of the second bar gives this groove a very upbeat feel and adds a certain swagger to it. A song that really shows off that swagger is the rock classic Born To Be Wild by Steppenwolf. This groove drives the verses of that song and gives it the rebellious feel needed. Grooves that are 2 bars in length, such as this one, present their own challenges when playing them. The first challenge is being able to play the whole pattern continuously without changing it. I find that singing the pattern in my head while playing helps me to keep it correct. Record yourself playing the groove for an extended period of time; can you play it for 3 minutes without changing the pattern at all? Add some fills to spice things up! Obviously, you can change the fills to suit your musical needs, make sure you’re able to play fills starting on any beat of that last bar. For suggestions on fills, head over to our fill of the week section. If you’re in Singapore, and you’d like a free trial drum lessons, contact us via the contact us page and we’ll get back to you as soon as possible! This fill uses 3 note groupings over 16th notes. 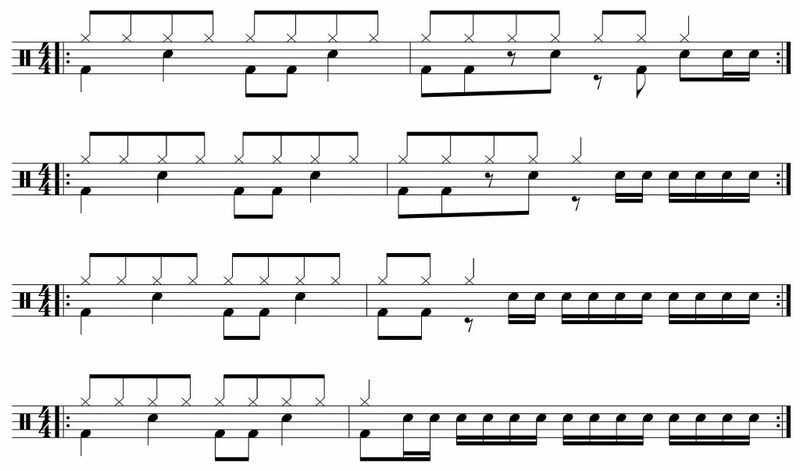 This is a very common way of phrasing drum fills & this fill is a good introduction to it. In any bar of 16th notes you can have 4 groups of 3 and 1 group of 4 notes. This fill is phrased as 3,3,3,4,3 to make the movement from the floor tom back to the snare drum easy. Here are some variations on this fill that moves the group of 4 around a bit. Another good thing to practice when playing this type of 16th note fill is putting the bass drum on quarter notes underneath the fill. This helps to add more weight to the fill, makes it feel more complete and it keeps the pulse going so the listener doesn’t get lost (hopefully). Here’s the original fill with the bass drum added. Now try adding the bass drum to the other variations. If you’re in Singapore and you’d like drum lessons, you can arrange a free trial lesson on the contact us page. 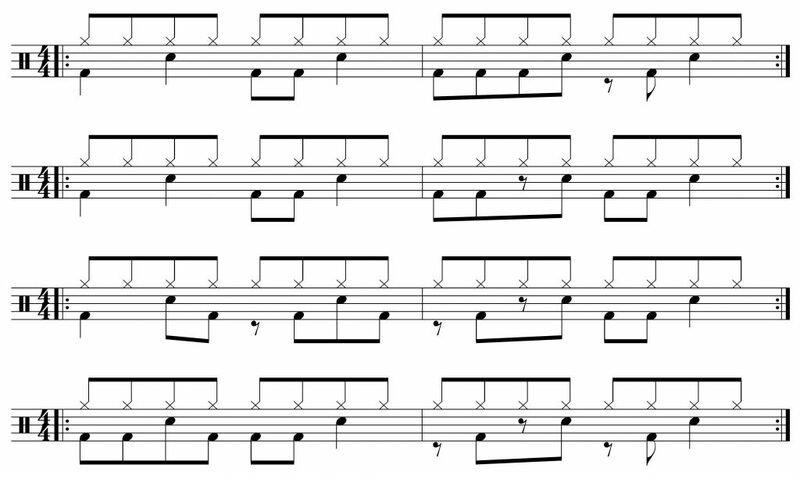 Like Groove Of The Week 1, this is a basic groove that is probably the 2nd or 3rd one that students learn when they first start drumming. It features in so many songs that you really need to spend the time to master it. You’ll have heard it in songs by Green Day, Coldplay, Maroon 5, Imagine Dragon and many many more. As with all these grooves, make sure you record yourself playing it and focus on playing it as smoothly as possible. Remember that you are laying a foundation for a band to play on top of, if you don’t provide a strong & solid foundation the band isn’t going to sound any good. You may find this challenging at first, but it’ll give you 3 very useful variations of the same groove. If you’re in Singapore and you’d like a free trial drum lesson, send us a message on the contact us page.